Happy New Year – the year of MMR! Wanted to give some updates on progress on the Medieval Madness Remake to start the new year, and hope everyone had great holiday break! I touched base with Josh over the phone (as we are in CA and he is in Chicago), and the feedback was “It plays like a Medieval!” and “gotta say I was really impressed with where he’s (Doug Duba, Chicago Gaming) at with development” . In fact he seemed somewhat surprised that it played so well – he had made some suggestions as well as helped align the flippers perfectly, and saw no difference as to the original feel of playing the game with “a restored original”. So, this is great feedback, and another step to production in a few months. Josh knows this game intimately and as well has grown up from watching it on the WMS production line to playing it, to competing in tournaments on it. This entry was posted in Medieval Madness Remake! (MMR) on December 31, 2013 by admin. Here we have the PROTO Medieval Madness Remake (MMR) in action at Chicago Gaming in (Cicero, Il, 12/17/2013) – game plays well and software is being fine-tuned as needed, but all gameplay is that of a Medieval Madness game! As we have consistently noted, the objective for the MMR is to look and play as an ‘original’ Medieval Madness plays, while updating/modernizing some of the electronics. Some minor cosmetic changes (copyright notices, and lack of WMS logo) as required by WMS Gaming License terms. You will see the small board in the backbox, that is the main processor board for the new generation control system platform that the MMR will be using. We’ve take the translite off so that everyone will see that it is indeed an MMR game playing. Additionally, the display is the LCD and looks great! 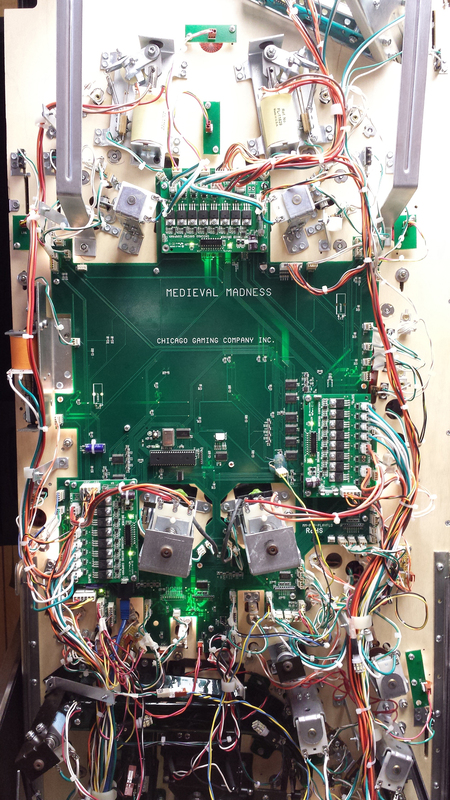 The MMR is a traditional look and feel of Medieval Madness (top of playfield and bottom mechanisms) – the electronics have been upgraded for many good reasons (better sound, display, native LED support, updatability, supportability, etc, etc, etc.). 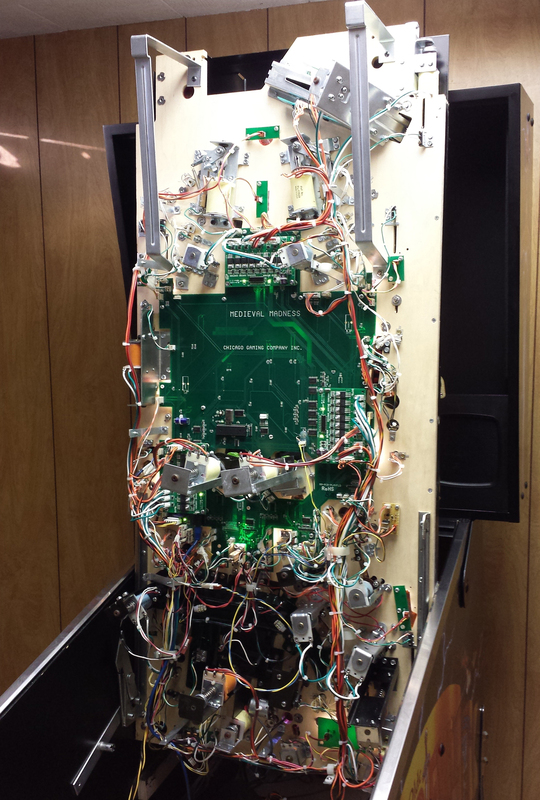 Here are a couple of pictures of the underside of the playfield. As you can see, the mechanical aspects are almost all original OEM parts. The complete electronics system have been running since late summer 2013, and going thru iterations and most PCB’s are on or near their final revision. The game will include run natively LED’s which will be selected to represent the original look and feel of the original game lighting. Here is a closeup of the controller board, which is the main ‘brain’ of the electronics system, handling game code execution, audio, video, update (with microSD card), etc. Cables in and out for Display, Audion, Cabinet/Door Switches, Power, and lower playfield board which interfaces to playfield switches, controlled lamps (LEDs), and Power Circuit (Power Driver sub-boards). This entry was posted in Medieval Madness Remake! (MMR) on December 18, 2013 by admin. This entry was posted in MMR Re-Sellers on December 13, 2013 by admin. Q: Will the game ship with cabinet/leg protectors? Q: How will audio be compared to the original game? Q: At what point in the process will we know the game # for the LE’s? Q: If I ordered thru PPS, can we make payments towards the balance ahead of time? Q: Is the game going to ship with Black or White Rubber rings? Q: What type of Display will be used on the game? Q: How will the Game be Similar -or- Different from the original Medieval Madness game? Q: Of the items which are ‘different’ due to WMS Logo Requirements, etc, would I be able to replace those with the ‘original’ WMS Logo replacment parts? Q: Why not use the original WPC-95 boards? Q: What is the timeframe for release? Q: What is the price of the MMR? Q: What is the warranty on the game? Q: When and how do I have to pay? Q: For the MMR LE, I have to choose between ‘Gold’ Trim and ‘Silver’ Trim – how can I see this to make the choice? Q: How will the Shaker motor be implemented as the original game did not have a Shaker motor? Q: Is the cabinet the same as original? Q: For the MMR LE’s how to Game #”s work? Q: WIll the cabinet have decals or silkscreening? Q: Are all playfields, wireforms, plastics, etc, interchangeable between the original and the remake? A: The game has been designed to include the new metal brackets on the outside which move the leg away from the game and prevent damage – which can occur with the various plastic aftermarket protectors – especially the ones which extend beyond the leg. This is the solution that is being used on all new games and we feel the best way to protect the game artwork from being disfigured. A: Better, as we have the original uncompressed sound files for the game and those will be used as opposed to the compressed (which lose quality) files on the original game. In addition we will use modern amplifier circuits and speakers which will improve the sound effect. Q: At what point in the process will we know the game # for the LE”s? A: The game numbers that are not reserved will be assigned very close to ship date. A: I suppose you can, but no need to, better to put that money in the bank and make a little interest! Again, the approach from PPS is that we request a small deposit which confirms a serious order which will get you a game. Shortly (a couple of weeks) before the game is ready to leave we will request the balance due for the game. If your distributor wishes to hold additional money on payment plans, that is up to them, but we do not require this to hold a game nor should your distributors. Q: Will the game come in 220V and 110V? A: The game will come with a transformer and power supply, both of which are switchable between the two voltages. As we get closer to the build time, we will request some additional information from distributors as well as our direct customers as to the voltage to set as default. Additionally, your distributor will be able to help switch the voltage if for any reason this needs to be done after shipment. This entry was posted in MMR FAQ on December 7, 2013 by admin. Have more questions for the FAQ? Great! Then ask them thru the “Customer Service” tab on the main page or click HERE – use MEDIEVAL MADNESS REMAKE QUESTION for Type of Request and we will try to answer all questions using the FAQ! A: The MMR (LE and STD) will ship with an LCD which will be similar size to the Plasma display that was original to the game. The LCD will be able to be set to any of a number of single colors (green, red, orange, blue, etc) for the entire display. A future upgrade expected sometime in 2014 would be an upgrade (expected to be software) that will provide ‘multi-color’ display frames. A: The game is required per our WMS agreement to ‘look’ as well as ‘play’ the same as the original game. As such the game is going to have same playfield upper and lower mechanical components as well as cabinet/backbox as original game (using original prints, OEM parts, etc). What will be different is the Electronics Platform which will use a new Current Technology board set, which will be running the WMS game code. 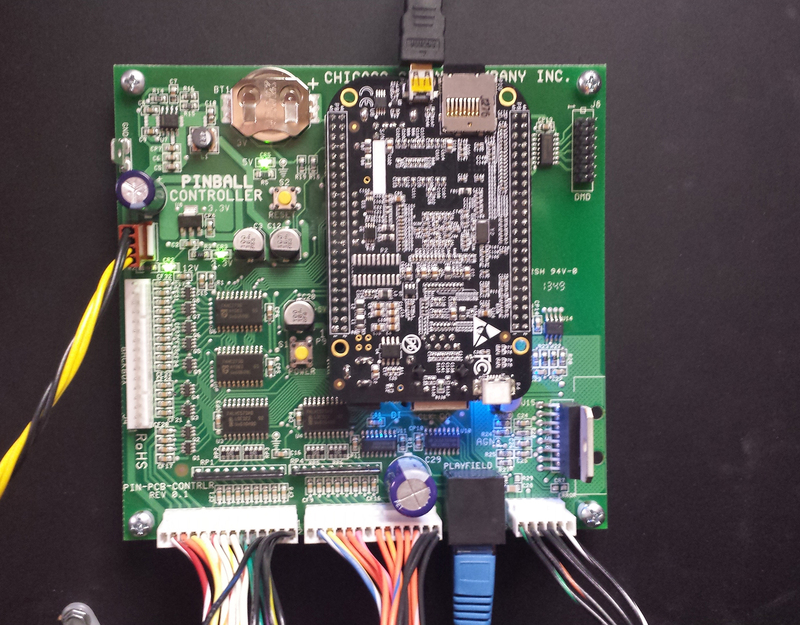 The new board set will incorporate LCD Graphics, Upgraded Sound, as well running on a new CPU/Controller board working as well as new Driver Board System. Additionally, the system will support native LED (no flicker) capability. The only difference is that for the remake we will not be including the WMS Logo’s (“W” Logo, Williams Logo), as well as there will be updated copyright wording on Translite, etc. We may also be including PPS logo on the translite to designate that it is the remake – much of this is per WMS requirements. A: The game will not change in terms of accepting those parts – so things like translites, speaker panels, etc are relatively easy to replace with a replacement WMS part with WMS logo’s, etc. The side decals would be probably the item that is not easily ‘replaced’. A: Because while we want the game to look and feel original, we wanted to offer additional capabilities like upgraded sound and video, native LED support, as well as to offer software updates. In addition we wanted to work on improving the designs from the original board sets reducing faults (transister shorts, etc). Additionally, those designs are based on 15 year old technology and we are using many off the shelf components using modern technolgy, which will allow for better support, availability of spare parts, etc (many of the original WMS WPC-95 parts are no longer available or are not compliant with new standards ROHS, etc). Additionally, we are working on designs which will make it easier for the home user and the commercial user to have field replaceable units to repair any major failure points as opposed to having to do onsite board repairs, etc. A: The MMR LE’s will be build in their entirety and then the MMR STD’s will be built. The MMR LE schedule is to start in Q2 2014 and ship until all 1000 are done which we are targetting for that ending in Q4, and then the MMR STD’s will be built starting in Q4 2014 and run until we exhaust orders, and then may schedule additional runs based on demand. A: The price of the MMR LE and the MMR STD is $7995 FOB Chicago. A: Warranty on the game is 1 Year (updated from 90 days) Electronics, 180 Days all major functional parts – common wear parts (rubbers, balls) are not covered under warranty. Warranty is valid only for customer of record (i.e. if original customer sells their game within the warranty period then the warranty is no longer in force). A: There is a $1000 deposit required for the MMR that is placed with the distributor who then forwards that $1000 to PPS to constitute an ordered game. Deposits are refundable in the event for any reason the game is not produced. The MMR LE Deposit is refundable up thru the point at which WMS approves the game (expected end of 2013), at which point the procurement of parts for the game occurs. For the MMR STD, a deposit received will determine where in the production sequence the customer is to get their game (deposit received to PPS, which customers must request that any distributor insure that their deposit has been forwarded to PPS), as well as to insure that there is a valid order for the game. The customer is then reponsible to pay the balance due to the distributor for the game,1-2 weeks before the game is ready to ship. A: For the ‘Silver’ trim this is the same as what was on the original game (stainless steel lockdown bar, brushed steel side moulding, and brite zinc plated legs). The ‘Gold’ trim is being determined, and as soon as we have determined the exact finish of the similar components we will show people what they are and will allow people to change their trim selection based on seing the actual ‘gold’ finish items. A: The shaker motor will shake the game for a duration and intensity based on various feature inputs from the game – the most obvious being the Castle explosion feature on the game. The shaker motor will be software controlled. A: The cabginet should be the ‘same’ as original, as we are using the original cad files – so dimenstionally as well as where major nuts/bolts go should be the same. Chicago Gaming was in fact the original manufacturer of the WMS MM cabinets back in the 90’s so they are very familiar with building these cabinets. A: For the MMR LE, there is a game # (from 1 to 1000) as well as a plaque indicating as such. The game # does not correlate to when the game was made, but it is a unique game # that can be chosen by the customer for an additional fee or will be designated close to build time and assigned to that customer. Game #’s can be requested for usually an additional fee, and if available will be assigned to that customer once confirmed. A: The cabinets will have decals applied from the factory. These decals will be updated for MMR as we have scanned at high res a very nice MM cabinet (actually cut apart the game! ), and that artwork is the basis for the MMR artwor, to make it as exact as possible to the original. Also cabinet decals enable easy replacement if needed over time due to wear and tear. A: Most of the parts other than the electronics related parts are the same original WMS MM parts – so this would be the ‘above’ playfield parts, as well as the mechanical assemblies under the playfield. 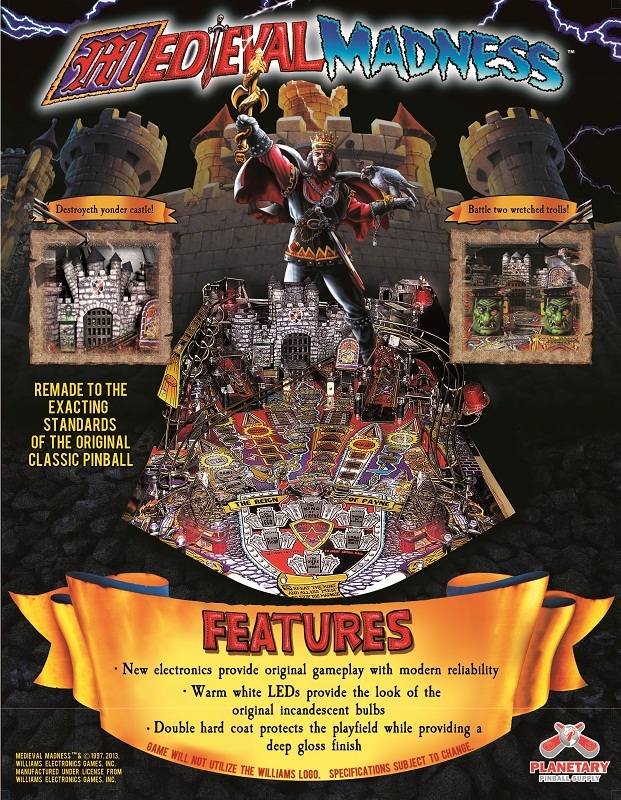 The playfield itself is the same playfield with the exception that there may be some different holes for mounting the electronics boards under the playfield, LEDs, etc. This entry was posted in MMR FAQ on December 4, 2013 by admin. 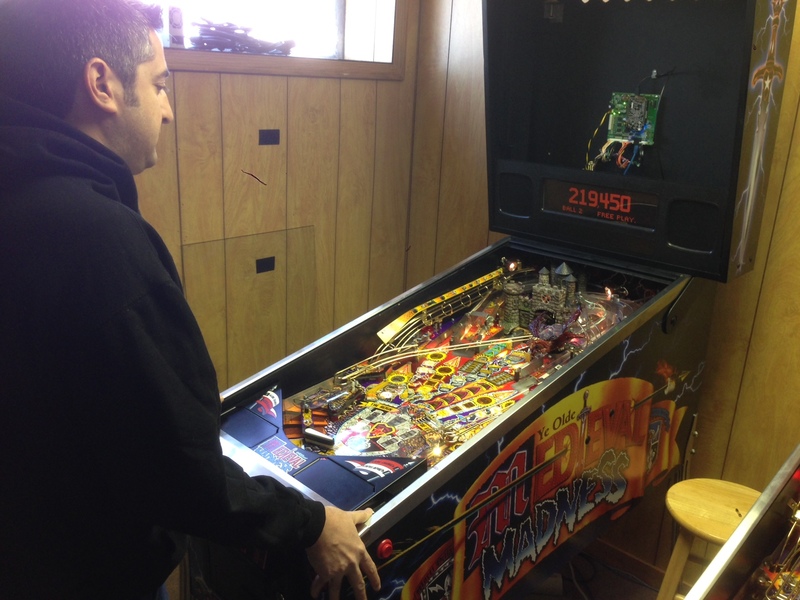 Welcome to our Blog … Planetary Pinball Supply, Inc is license of Williams Electronic Games (WMS) for replacment pinball parts, pinball games, as well as pinball merchandise! 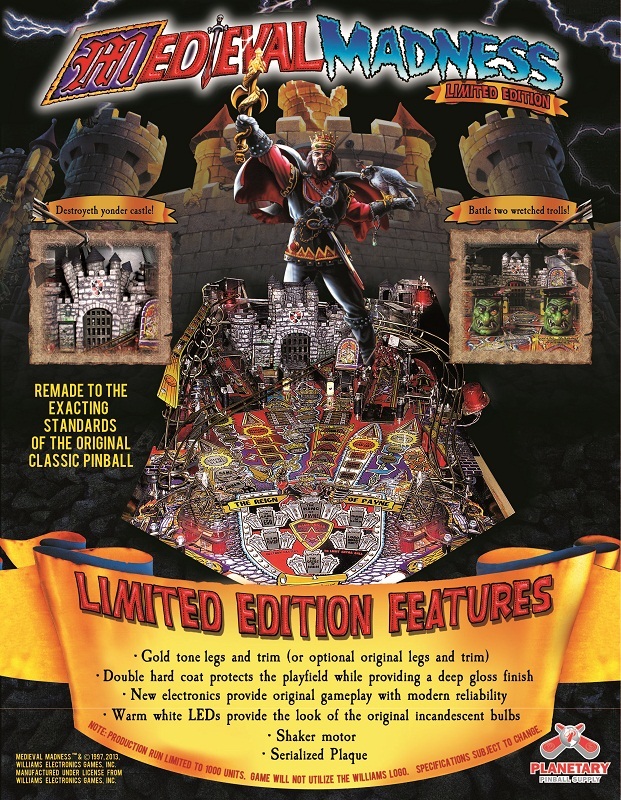 This entry was posted in Planetary Pinball Supply, Inc. Blog on December 4, 2013 by admin. PPS Medieval Madness Remake (MMR)! We are remaking the Classic and Most popular WMS Title MEDIEVAL MADNESS! 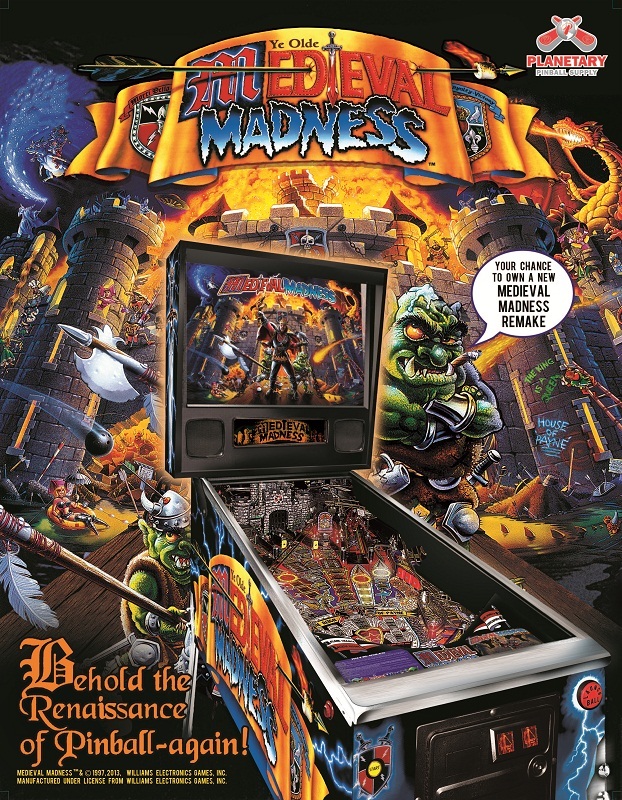 This will be the official BLOG for the Medieval Madness Remake (MMR) – the remake is being designed and manufactured with our partner CHICAGO GAMING, who in fact manufactured the original 1997 Medieval Madness game! We instantly sold out of the 1000 LE’s (Limited Edition) Model and released that weekend the availability of the STD (Standard) Model, which is available now for ordering. The plan is for availbility of the LE’s starting in Q2 2014, and then as soon as the LE’s are done then we start shipping the STD models – expected around Q4 of 2014. There is no limit on the STDs, but the sooner a deposit is received the sooner you will have a position in the queue of the build of the STDs. This entry was posted in Medieval Madness Remake! (MMR) on December 3, 2013 by admin.